Classic D&D region sourcebook covering a Magocracy in the Mystara setting. Though the Red Wizards of the Forgotten Realms setting get more attention and have lasted longer, Glantri's IMHO the more interesting and playable nation of mages. The third in the gazetteer series (see here for more on the series as a whole), Glantri is essentially the Western European analogue within the Mystara setting. But- and I may sound stupid saying this- I didn't really get that until I went back to reread the series. Other entries, GAZ1: The Grand Duchy of Karameikos and GAZ2: The Emirates of Ylaruam for example, wear their sources on their sleeve. The Principalities of Glantri conceals that beneath details of magic and the melting-pot background of nation. It is a country of immigrants, powerful noble families here having united under the banner of magical superiority. Only those possessing sorcerous skills have rank or power here. Each family borrows from a particular culture (German, Spanish, Italian, Scottish, etc) but that always felt like a surface trapping when I read the book. As a whole, Glantri feels most like France, with the different provinces sharing a common heritage, but with distinct expressions of identity and a strong independent streak. In rereading I spotted more of the literal borrowings, but they still work. For all that it riffs on those European stereotypes, GAZ3: The Principalities of Glantri manages to elevate those ideas and do something new with them. The Principalities of Glantri remains my favorite of the gazetteers, with Karameikos coming in a close second. I've used ideas from it more than any other volume in the series. And I've only really only presented surface elements. We've had a few sessions skirting Glantri, but I've used characters from there, with their distinctive approach to magic and the cultural ideas. That's trickled down and informed other parts of my setting. GAZ1: The Grand Duchy of Karameikos presented a small nation, with two distinct cultural groups, and a focus on local NPCs. GAZ2: The Emirates of Ylaruam compressed a large number of cultural groups, essentially a sub-continent, into one country and focused on ideas and themes. GAZ3: The Principalities of Glantri again takes a large and diverse cast of cultures and brings them together, but with a tight focus on noble family. Beyond that, Glantri organizes itself very differently from the previous two volumes. Larger than the last two, 96 pages instead of 64, it presents a structure for a specific campaign. Glantri presents the tools for a DM to run a full party of mages from apprenticeship through adult adventuring life. That campaign has the characters uncovering the secret behind the power and powers of Glantri itself, the Radiance. Despite its difference, this approach still fits with the rest of the line. It isn't surprising that Glantri- in some ways the most full-fleshed and developed of the gazetteers- comes from Bruce Heard, product manager for at least the early line. His name appears on most of the significant Mystara products in one way or another. The Principalities feels like something that the author has run and played with, rather than a product created to fill a niche ("OK we've got a Hobbit place on the map, who wants to do that?"). Heard's name also appears on the later version of Glantri- Glantri Kingdom of Magic- when TSR brought the setting up into AD&D 2e. I dislike that later product intensely, in great part because I like the material here so much. Instead of adding to it, that knocks down and ravages it in the name of change. Eventually I'll get to a review of those products after I've worked through all of these. Besides the change in length, Glantri only has a couple of other minor changes to the physical design of the series. The main saddle-stapled booklet comes with a folio cover as usual. Instead of the tri-fold of the first two, this cover is a bi-fold. The two interior pages have location maps- one a common Wizard Keep and the other The Great School of Magic. The latter's a little disappointing, because it doesn't really look all that grand. It would be a few more years before we saw epic mage locations like those of Ars Magica, Harry Potter and Redhurst, so that can be excused. The enclosed poster-sized map is the first in the series printed on front and back. One side shows the hex-grid map of the Principalities, plus three inset map locations that are OK, but not great. However the reverse side offers a really awesome map of the City of Glantri- wonderfully laid out with canal waterways. Three inset images present details of the harbor and special buildings. This is one of my favorite city maps. It is interesting and useful- I can imagine running a chase using it. The booklet sticks to the same three columns with tiny text of the previous two volumes. Some of the pages have a watermark, but those with illustrations or colored sidebars don't. Stephen Fabian provides the excellent art- there's a nice mix of images for key NPCs and illustrations of material discussed in the text. This book, more than the previous two, relies on narration and stories. We get tales from newcomers and foreigners, as well as testimonials from important NPCs. Just about every major section has some kind of game fiction dialogue. These are very targeted, with the narrator describing a particular event, person or institution. I'm often pretty negative about game fiction fluff- but here it works well. It sets the tone of the material and offers some insights on presenting the ideas to the players. The Principalities of Glantri provides some of the same basic material as the previous two entries in the series: history, economy, geography and so on. But the actual execution of that material, as I mentioned above, is in the form of first and third person narratives. The stories say as much about the narrators as they do about the topics. The author also sets up the gazetteer explicitly as a campaign from the outset, discussing how the pieces presented fit into that. But even if you're not planning on running a Glantri-mage centered game, the material still works. I can attest to that, having adapted the ideas across years of my house campaign and across several different systems. DMs should be aware of a couple of important structural restrictions right off the bat. 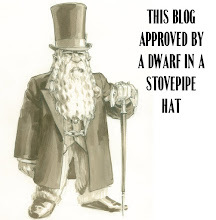 Dwarves are welcomed in Glantri, but mostly because of their desirability for magical experimentation (i.e. they can survive longer). Second, and perhaps more importantly, clerics of any kind are illegal within the lands. That's an interesting distinction- and offers some insight into a world where ascended Immortals take the place of gods. I don't want to dwell on the specifics of the chapters- they thoroughly covering important aspects of life in this nation. That's tough to do given the diversity of peoples here. The DM will have to do some serious filling in of details of normal life, since the focus stays on the elite of the country. Different family lines govern each Principality, each with a distinct origin and cultural background. While they share a common adherence to the magocracy, they are (of course) at each others throats. That makes Glantri an interesting and highly political setting. A number of the families don't even come from this world originally. Most of the material presented in the first third of the book focuses on setting up those different families and their personalities for the players. House of Sylaire aka d'Ambreville: "Mutant Werewolves of Averoigne"- I mention them first both because they're the most powerful and also because they have the strongest tie to classic D&D history. Veteran players may recognize them from the module X2: Castle Amber (Château d' Amberville). They came to this world from that one. They're also a lift from both Edgar Allen Poe stories and from Clark Ashton Smith's stories of Averoigne. CAS remains my favorite old-school fantasy author, and it is interesting to see how his weird fantasy ideas translate into a game more heavily influenced by the likes of Vance, Tokien and Howard. As you might imagine, the d'Ambreville borrow from French cultural traditions. House of Crowngaurd aka McGregor: "Chauvinistic Scots of Chaos"- another family who came here from the same world as the d'Ambreville. Heavily invested in necromancy, they are governed by a leader who has converted himself into a lich through the powers of Radiance (a concept I'll come back to). House of Igorov aka Gorevitch-Woszlany: "Expansionist chaotic vampires"- another family with necromancy in its blood. Trace their family line back to the Traldaran's of Karameikos. As you can imagine, they come off as very Transylvanian. House of Linden aka Vlaardoen: "Vengeful Followers of the Fame"- a family descended people originally from another world, their fellow refugees went on to found one of the two great empires in Mystara, Alphatia. They seem to be borrowing from the Dutch, but those connections are pretty light. House of Ritterbeg aka Von Drachenfels: "Warmongering Military Technocrats"- The military backbone of the nation, and one borrowing heavily from Prussian and German cultures. House of Silverston aka Aendyr: "Sneaky Alphatian Imperialists"- Rivals of the Vlaardoens they descend from more recent exiles from the Alphatian Empire. They don't borrow distinctly from a single culture. House of Singhabad aka Virayana: "Lawful Pacifists of Ethengar"- They originally come from the nomadic peoples of Ethengar (covered in GAZ12: The Golden Khan of Ethengar). They have the most tolerance for clerics. House Sirecchia aka di Malapietra: "Poisonous Thyatian Machiavellians"- They come from the other major empire of Mystara, Thyatis. However they have a more classic Renaissance Italian feel to them- which differs slightly from how the Empire ends up portrayed in the later boxed set Dawn of the Emperors: Thyatis and Alphatia. In fact, they have more in common with the presentation of Darokin (GAZ11: The Republic of Darokin) the nation of merchants. Clan of Alhambra aka Belcadiz: "Proud Elven Swashbucklers"- This Elvish family doesn't come from the Elves of this continent, but rather from a land far away. They're short, hot-tempered and based on Spanish themes. Clan of Ellerovyn aka Erewan: "Tree-Loving Elven Ecologists"- This Elvish family, on the other hand, comes originally from Alfheim (covered in GAZ5: The Elves of Alfheim). They're more classically 'Elfy'. So you can see Glantri bursts with ideas and plots. Several excellent sections break down those families, provide insight on their relations and describe the major NPCs of each. That material bleeds over into the other major power-players in the lands- guilds, brotherhoods and secret societies. 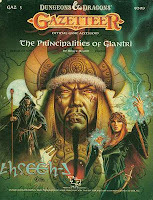 The middle third or so of the booklet (running from page 38 to 63) covers Glantri City and the Great School of Magic. While the various provinces have their own towns, villages, and castles, Glantri city is the hub. Most campaigns will begin there, and it alone could offer the background to many sessions worth of gaming. 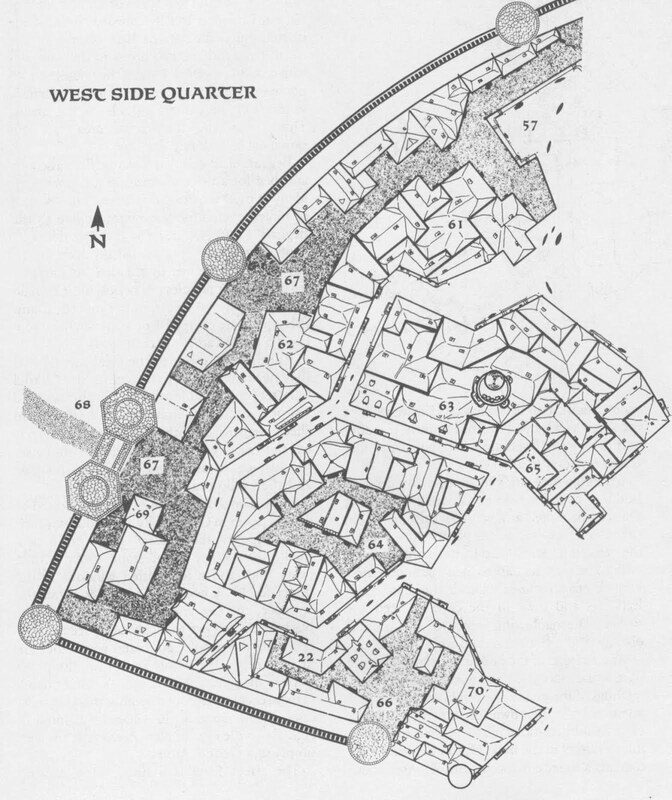 This chapter breaks down the city by neighborhoods, provides a calendar of festivities, and outlines the laws, atmosphere and daily life of the city. All of it is great and useful information, well-presented. More than any other GAZ in the line, Glantri brings to life a city with rich detail for the DM to draw from. On the other hand, I'm a little surprised in going back how little information the booklet actually gives for the Great School of Magic. It offers some mechanics and details (tuition costs, some feat-like bonuses which can be picked up, and graduation tests) but it seems a little bit of a missed opportunity. That may be in hindsight, given other more famous magic schools which popped up. Still the ideas given are excellent and fun. The last third of the booklet offers substantial DM tools and mechanics. First, it provides a toolbox for creating new spells and magic items. Such things cost gold to create- representing resources invested in the project. Next, the book explains the secret of the Radiance, magical energy present in Glantri and tied to the Immortal Rad. The secret's in the name and ties back to elements from the Blackmoor background. This section provides some ideas on how the players might learn these secrets, harness spells from the Radiance and even change the course of history. That's, however, optional to the setting and feels a little unnecessary. Beyond that, the section offers new seven secret crafts (with new spells): alchemy, dragon magic, elements, illusions, necromancy, runes, and witchcraft. These offer some great ideas for a GM wanting to expand high-level magic in their campaign. Finally, the booklet finishes with a list of adventure seeds, broken down by level. Many of these are linked- given the GM the skeleton of a long-term campaign in this region. I love this book. a DM could easily run a campaign just using the stuff given here. That economy is admirable- a booklet which offers in 96 pages what many books would have needed twice that to do the same thing. There's little waste here. There are a few goofy things- like the Scottish Liches and the Apocalypse Now references in the adventure section. But it offers a wealth of ideas, cultures and peoples. Most of all they're fun- even when they're a little sinister. Even the bad guys here have to function in cooperation with the other families, making it both more real and more interesting than the Red Wizards of Thay ever were to me. I've used the ideas, families and characters from this supplement for years. My players know those family names and can remember the distinctive traits of many of those lines. I count that as the mark of great source material- when it creates fun and memorable moments at the table. I really like Glantri--well, mostly I like the idea of it. The cultural combos get a little hodge-podge without developing a Glantrian culture of its own. If I remember correctly, the original sketch of the Known World in Expert suggested Glantri was a bit Venitian. That was an angle that doesn't get so much attention as I would've liked. I do like the "refugee from our world" angle--particularly as it ties in to Clark Ashton Smith. I always tought the CAS short story "The Holiness of Azederac" opened the door textual for his creations to interact with other worlds. A link I made a nod to in writing Weird Adventures. 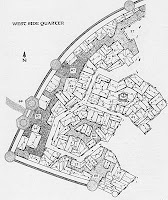 Agreed- and the whole layout of the City of Glantri suggests that Venetian origin. It makes a dynamite backdrop for a game. But it is weird that we do get a very, very Venetian society later in the series, with Darokin. The hodge-podge or "kitchen sink" approach of the families does seem a little overwhelming, and certain of them I've given less attention to over the years (Sighbad, Silverston for example). Of course several of the families get "blown up" in the later Glantri, Kingdom of Magic supplement. CAS doesn't get nearly enough love- I've borrwed many of theme themes and names (Xothique) for other places in my campaign world. I think one of the most interesting things about using elements of Glantri in my setting has been the adaptability. The players know enough about the families from Glantri to be able to approach NPCs with some stereotypes and impressions. I've been able to play off of those- to deepen or contradict them. The thinness of the details has also allowed one player to really build up a lot of detail- she's playing a d'Ambreville and she's been able to essentially create the rest of the Glantri world through tales of her homeland. I, of course, take notes to use those later in the game. Great review. These GAZ reviews have certainly sparked a renewed interest in Mystara for me. I can just agree with Nakia! Great job you're doing. Glantri was the first Gazetteer I was able to get in Germany in the days... it still hast some special place inside my heart. Thanks- I really hope to be able to work my way through the whole line. Some are certainly stronger than others, but they really do have a kind of open, 'anything goes' approach that is refreshing. I have always enjoyed Glantri. I have say though that Glantri City is actually based on Amsterdam not Venice. The Vlaardoen family are Flemish (from Flanders)rather than Dutch hence the use of "Flaemish" to describe them. The Aendyr are supposed to be Corrupt English Aristocrats. They used the relationships and histories between these real world cultures to supplement this gazetteer, I was surprised by how much thought had been put into this product. Its such a shame they tried to get rid of the gothic aspect of this setting when they released it as an Ad&d campaign but then it would have competed with the Ravenloft campaign. Ravenloft just seemed a pastiche of this, Glantri is a lot more fun. Nice review and study of an old favorite of mine. Bu then, I'm more than a little biased. Keep up the good work. Cheers! Lowell , great review and i agree it is the best Gazeteer. The amount of gameplay it generates sensibly really puts it apart. @Anonymous: That's an interesting take- certainly I'd always read the Flaemish dynamic as drawn from the Dutch- and the others as being from various Western European nations- but I'd assumed Venice- in part because I don't know Amsterdam at all. But that makes sense, especially if the later Darokin module went the direction of more conventional Italianate borrowing. Hey, nice articles! I love the Gaz series, and Glantri is my absolute favorite! It was fun reading your impressions. Great article. This brings back memories. Mystara was an extremely interesting setting, but I can see why Wizards of the Coast killed it - it evolved from a hodge-podge of unrelated game modules, the geography and design of the world was a bit disorganized (although the Hollow World was an interesting idea) and it competed directly with the Forgotten Realms setting, so they had to make a choice. 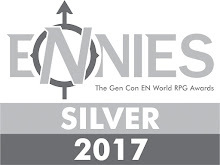 The Realms made more sense, having been built from the ground up and being the most popular campaign (I also switched to the Realms later on and never went back). I still miss it, though, and the Gazeteers provide great story ideas for other games and in.house settings. My only Mystara campaign (1980s D&D, later AD&D house rules) ran through most of the world, but mainly in Rockhome, Northern Reaches, Thyathis, Thar, Shadow Elves and Glantri - which was personally my favourite bit. Glantri was possibly the most well-designed, fun and unpredictable part of the series (although GAZ 13 Shadow Elves was also a revelation). 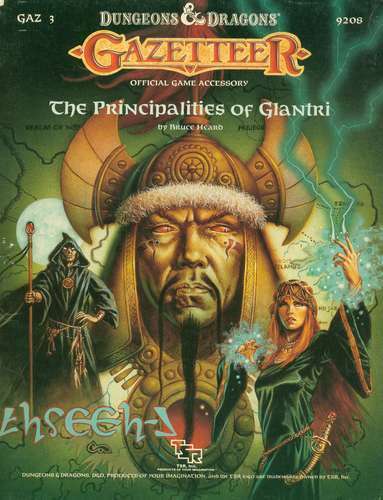 The Principalities of Glantri is in my opinion one of the best role playing materials published. Why this Gazeteer works for me is political dimension. The different noble houses are very powerful and have agendas and personalities way beyond typical stereotypes back then - this was quite revolutionary for me. It made me look for the name Bruce Heard whenever Mystara material was coming out since it was a mark of quality for me. I have played numerous campaigns in Glantri both a player and Dungeon Master since you can always introduce players on the bottom-rank of a new house or as immigrants lost in the web of intrigue. The power and politics makes it easy to push the players around and where they have to watch their step very carefully. No matter what they do they will get powerful enemies and (perhaps) allies. Also it makes it easy for a time-pressed Dungeon Master to work out the plans of the Houses in reaction to players actions. I have had great success playing solo-adventures for a young magic user arriving from a village (outside or within Glantri) to start his/her studies at the Great School of Magic and let the actions of the player dictate the outcome of the campaign. In Glantri every trivial player action counts - who you talk to or not (or talk back to instead of lowering your gaze when a 12 year old rich brat insults you), who you help or not, when you need money for tuition what job do you take or who do you borrow from? Very few settings has made me able to keep a player constantly paranoid - yet the player still had to feeling (correctly so) that they were fully responsible for what happened. With this kind of "reactive DM'ing" the story almost writes itself, if you have well written characters introduced from the beginning of the game. While Karameikos works very well for a group-setting Glantri is probably one of the best setting I have ever played solo-adventures in [Birthright being the other one]. 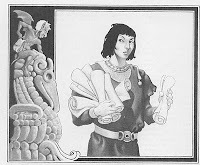 I can really recommend trying a political Mystara game for a sole magic user that allows a tough Dungeon Master to use all kind of unfairness in a world beyond good and evil - only he who play the political game well survives. The Galantri is an odd place to be sure. The vast bureaucracy that demands crudloads of gold to licence everything from spells, magical items and even the ability to carry weapons gave me such a headache to read. No low level PC characters would have any chance to afford the vast fees the nation demands. Your characters will also die horribly as there is no magical healing available as Clerics and God Worshiping are illegal. This means you will have a death wish playing as a divine caster and no means of curing disease, poison or other crippling conditions. Definitely not a place I would run a game!